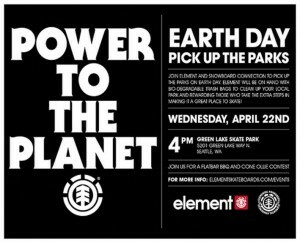 SnoCon and Element are teaming up on Earth Day to clean up Lower Woodland, and based on the condition of the place during last few times I’ve visited, it’s none too soon. They promise giveaways, some contest action, and free food. All you have to do is grab a provided garbage bag and pick up after your careless buddies to qualify for the free love. While you’re at it, bring some carb fluid and wipe out some of that awful graffiti. Or put up some ‘NO BIKES’ signs around the railings, because nobody reads the small print on those existing ones. You are currently browsing the weblog archives for posts tagged 'Lower Woodland'.